An element usually consists of an opening tag, closing tag and the content between them. See the structure of an element. The opening tag consists of less than sign(<), tag name and greater than sign(>). For example, (<p>). The closing tag consists of less than sign(<), forward slash(/), tag name and greater than sign(>). For example, (</p>). All elements have an opening as well as the closing tag. But some have only the self-closing tag. The self-closing tag consists of less than sign (<), element-name, greater than sign with an optional forward slash (/>). For example, (<br/>). You may add or remove forward slash(/) in the self-closing tag. That does not matter. You may have space between the element name and forward slash.For example, both <br /> and <br/> are correct. A full list of the self-closing tags (no closing tag) has been given below. p, area, base, br, col, embed, hr, img, input, keygen, link, meta, param, source, wbr. These tags are called void tags because they don't have content after these tags. Here a question arises that whether can we have the element name in uppercase or mixed form? The answer is simple. You can have the element name in lowercase, uppercase or mixed form. We take an example of an element. This example proves that uppercase, lowercase or mixed form may be used for the element name. The element name is case-insensitive. 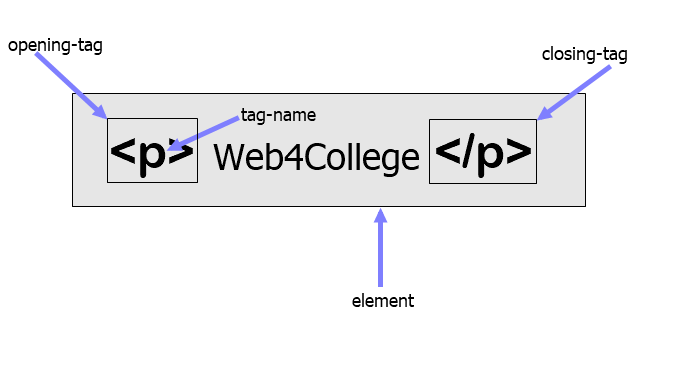 An element consists of opening tag, closing tag and the content between them e.g. <h1>. Opening or starting tag consists of less than sign (<), tag-name followed by greater than sign (>) e.g. <h1>.